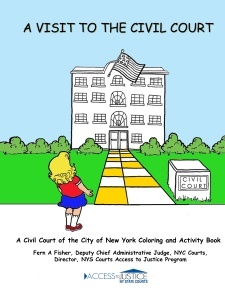 You may download the Civil Court's 15-page coloring and activity book. The book contains pictures of scenes in the court to color, and activities to solve, including a matching game, connect the dots, a word puzzle and a word search. Once you have downloaded the coloring book, print the pages and start coloring! For more court-related quizzes, word game and puzzles for children of all ages, go to the Court Classroom.